It has been widely acknowledged that patient recruitment and retention are the two most challenging aspects in conducting a successful clinical trial. Despite living in an age of incredible information technology that allows product sponsors and research partners to develop customized approaches and tailored communications in order to attract the right patients and caregivers to clinical trials, the statistics are sobering. Over half of all trials are delayed, nearly half of all sites miss their enrollment and/or retention targets and many trials are never completed—owing to difficulties in participant recruitment and retention. What is, in fact, most often lacking, is the creation of truly compelling brand communications and educational tools designed to effectively connect with patients and their caregivers to create awareness, build trust and drive enrollment and retention. To do so requires a better understanding of what truly motivates the target patients. Key to any patient relationship-building process is understanding both the verbal messages and the sensory cues that trigger the desired trial perceptions. SensoryQ® is a research tool that identifies the visual cues that trigger the desired brand pillars in the minds of the target enrollees. Target patients and/or their caregivers select stimuli from galleries that represent the brand pillars from which the Six Degrees team builds a sensory position for the trial. The sensory positioning then drives on-target visual identity design and marketing communications reflective of patient cues. As a result, SensoryQ® makes sure the creative communications “touch” the target patients and their caregivers and reduces the risk that communications pieces look nice but otherwise fail to engage. As trial brands don’t work in a vacuum, a well-planned brand and patient awareness plan must be developed and coordinated with patient recruitment initiatives. This may include SEO optimization for web sites, Google Adwords campaigns, social media campaigns and posts, patient awareness drip campaigns, targeted patient advertising and Advocacy Group partnerships. With a strong strategy and useful tools in place, sponsors can then provide their CROs and other research teams important brand communications and patient awareness strategies for use as part of their participant recruitment and retention program. When applied effectively and aligned with trial research strategies and steps, SensoryQ® becomes the all-important glue that holds the trial together and creates better overall patient awareness and engagement. 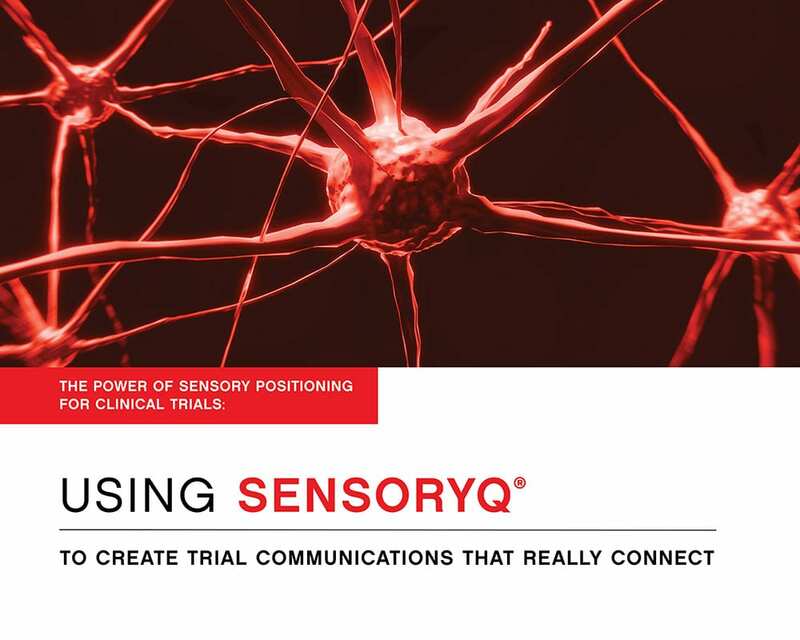 Contact us to hear more about SensoryQ® and our clinical trial branding services. We would be happy to share some exciting case studies and supportive analytics.